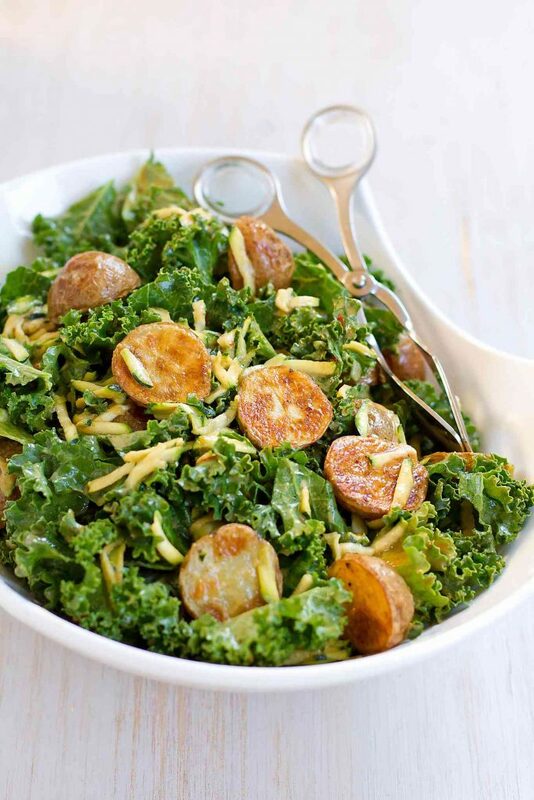 There are so many fantastic flavors in this healthy Thai Roasted Potato Kale Salad, which is tossed with a light peanut dressing.Thank you to the Little Potato Company for helping me to share this recipe with you. Craving vegetables is nothing new around here, but my appetite for anything that grows in the ground has gone through the roof this past week. I’m chalking it up to the couple of days of springlike weather we had this past week that made every single Pacific Northwester stream outside like ants to a summertime picnic. Not only did I pull on capris and a short-sleeved shirt, but I even bought tropical fruit (fresh papaya!) and made a margarita. And I ate copious amounts of vegetables. The obvious veggie road to take is the one lined with salads, but roasting or grilling is another fantastic way to impart flavor, especially to root vegetables, such as potatoes and beets (like the roasted beet salad I shared last week). The beauty of roasting, particularly when you’re starting with top quality produce, is that all that’s needed is a little olive oil, salt and pepper. 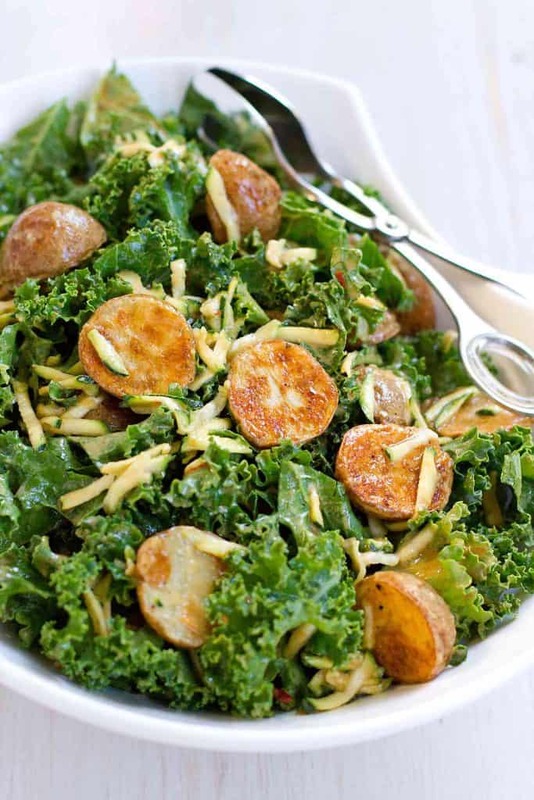 In this potato kale salad recipe, I used my favorite Creamer potatoes from The Little Potato Company. Their adorable little shape is perfect for salads and I cut each of them in half before roasting to make them a more manageable bite size. 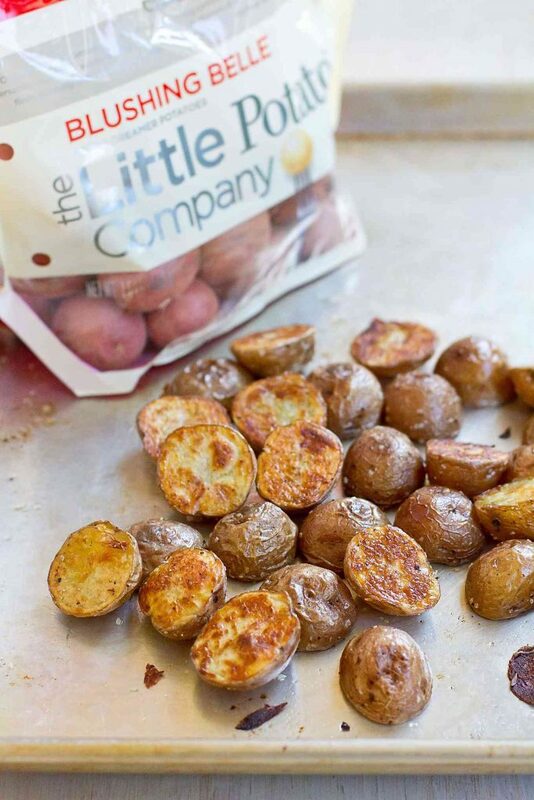 I happened to use the Blushing Belle varietal, but any of the Little Potato Co. varietals would work well in this recipe. If you prefer, substitute one of oven/grill ready packs for the bagged potatoes – the garlic herb or onion medley would be fantastic with the peanut dressing! 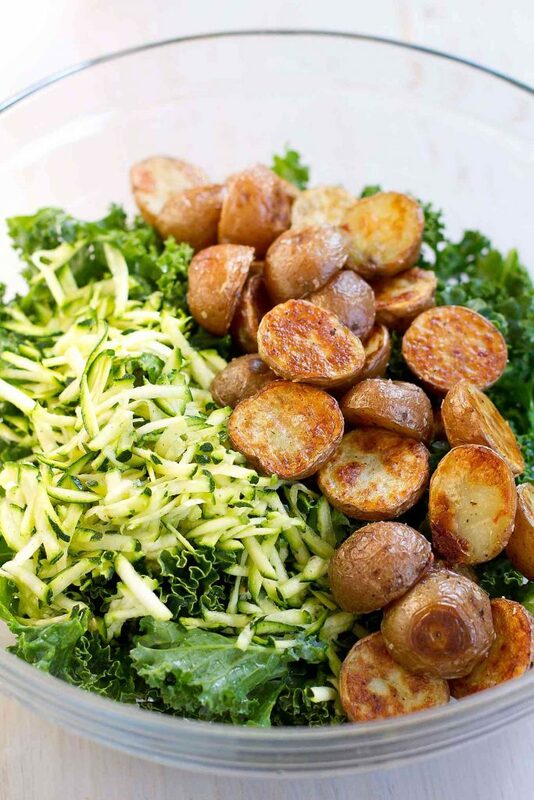 To save yourself some time, chop the kale, make the quick peanut dressing and grate the zucchini while the potatoes cook. Everything will be ready to go once the potatoes come out of the oven! And while we’re talking about the grated zucchini, I’m still giving myself a huge pat on the back for that addition. Why have I never thought to add raw grated zucchini to salads before? If you prefer to make this salad vegan, leave out the fish sauce in the dressing and be sure to use agave nectar rather than honey. Looking for a gluten free option? Substitute tamari for the soy sauce. To make this salad into an entree, top it with grilled or baked chicken, tofu or shrimp, or mix in some chickpeas. Cut the potatoes in half, place on a baking sheet, then toss with olive oil, salt and pepper. Cook until tender when pierced with a fork and golden brown, stirring halfway through, about 30 minutes. In a medium bowl, whisk together the lime juice, peanut butter, soy sauce, agave nectar (or honey), fish sauce, rice vinegar and chili garlic sauce. Whisk until smooth. Disclosure: This post is part of an ambassadorship for The Little Potato Company. All opinions are my own. This post contains links to my Amazon affiliate page. Any revenue made from sales through these links helps to support this blog. Thank you! Love the roasted potatoes! I think it really adds a new depth to this salad. Fantastic! I could not be more excited about this salad!! I love that this is a lighter, healthier potato salad. Perfect for summer! Roasted Potato and Kale? Yes please. I ‘d love this. I could eat roasted potatoes every day. This salad looks so good, I need to make it soon! I am so happy! Love those little potatoes and it’s a brand new salad for me. Love the FLAVORS! Oh my goodness, YES! What a terrific medley of flavors and ingredients! This sounds incredible and those crispy little potatoes have me drooling! I love that you added those crispy little potatoes to your salad, this looks delicious and I wish I was having it for lunch today! Those little potatoes look soooooo dang good! What a delicious salad! !